When asked for the definition of mental health and fulfilment, Sigmund Freud had two words: lieben und arbeiten, love and work. In this book we will find how 16 business leaders brought together their compassion, their caring for others and the world, with their work. True, only on rare occasions are we able to meet the person behind initiatives that made a positive impact on the world, even less have an in-depth view into their feelings, concerns, hesitations, doubts and most intimate thoughts. What is seen publicly is the initiative, the impact on the bottom line and the community, or sometimes on the environment. Yet it is their _personal_ stories that can be most inspirational, since they draw our attention to the fact that amazing achievements start in simple ways, with just the thinking of one individual. And when we find out that the "exemplary individuals" have many very "human" aspects that we identify with and find in ourselves, it brings us closer; and, particularly, it may even trigger in us the question: If she could do it... I wonder what could _I_ do? The interviews, however, were only the beginning of the journey. The lessons of the interviews made it possible to identify how we can all develop a sustainability mindset: in other words, the thinking and the being that can take us from breakdown to breakthrough on this planet. Each one of us can play a part in leading the change; in fact, we are already playing a part â€“ we are just not necessarily aware if that is the part we would like to play, or aware that we choose the change we are contributing to unfold. Part I presents the 16 leaders, including a summary of their story and their initiatives. Part II goes a little deeper, as you will find two dimensions that were not obvious but which underlie the way these business leaders championed the initiatives: the Thinking and the Being. Part III explores why sustainability change is so slow, and addresses the "elephant in the room": the values and beliefs that anchor our Western Weltanschauung, or worldview. Part IV addresses the alternatives that we have to convert the unsustainable values into opportunities that will permit humanity to thrive and to break through the obstructions that prevent us from stasis. Finally, Part V takes us beyond the tipping point, and presents us with an opportunity to evolve as humans developing a new way of thinking and being on this planet. 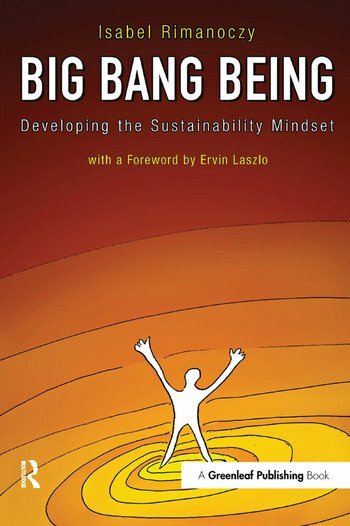 This transformation is so radical and significant, that the author calls it the Big Bang Being.